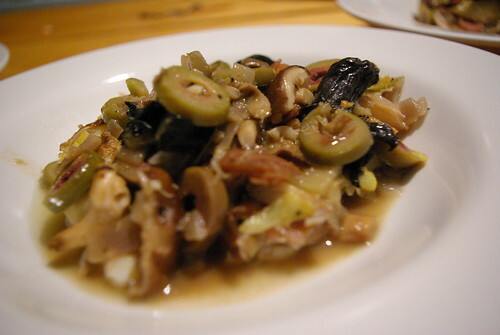 baked sole in white wine with mushrooms and olives, originally uploaded by aarn! +14th July, 2008+. sauteed some shallots in oil withe a few slices of prosciutto and then seared a few fillets of sole, then added lemon zest, garlic, oyster mushrooms, black trumpet mushrooms, chopped artichoke hearts and olives, and a fair amount of white wine, put in the oven and let reduce.